I was recently going through my list of Twitter followers and following some of the people who looked like they had interesting content. In the hours and days after that, I’ve been getting a barrage of Twitter spam from these people. What’s strange is that I’m not getting these from random strangers. These are people I know in real life and that are Twitter accounts that are pretty decently updated. It’s not just happening on my personal account. I’m seeing it on several other accounts I manage. I’ve found a few blog posts about this rise, but no one can point to a single cause or source. My guess is that these accounts have given, at some point or another, the OK to some web app or other platform the ability to connect to their accounts and send our messages. 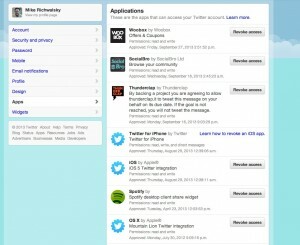 Now’s the time to log into your Twitter account on the Twitter.com website, not using a client such as TweetBot or Twitter on iPhone. Go to the settings and then apps. You should see something like this, a list of all the apps that you’ve given access to your account. That’s my page, and you’ll see I’ve given apps like iOS and Spotify the ability to post to my Twitter feed. The other thing to check for is what these apps have access to. Twitter allows you to grant these apps the ability to read, write and DM people depending on what you allow. As you can see, the Twitter app on my Mac has full access, since it’s the tool I use most. Klout, on the other hand, can only read my messages and not post on my behalf. If you see something fishy in your list of apps, or a service you no longer use, you should revoke its access to your account. Hopefully, spending a few moments on this today will reduce the amount of Twitter spam you may be possibly sending out.